Ildiko Kovacs, _Onda_, 2015, oil on plywood. Ildiko Kovacs has taken out the 2015 Bulgari Art Award with her work Onda, earning $50,000 for the acquisition of the work by the Art Gallery of New South Wales as well as a $30,000 residency in Italy. 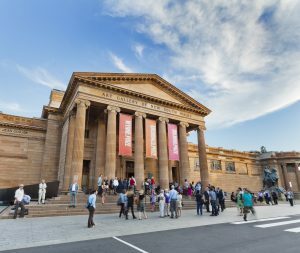 The lucrative award aims to support contemporary Australian painting by selecting a significant painting by a mid-career artist for recognition. Of the winning work, Kovacs’ says, “Onda means wave in Italian. My studio is close to the ocean and the sound of the waves is ever present”. Painting through memory and emotion in her studio in Bundeena, Kovacs’ work responds to the rhythm of the sea. “When I start to paint I try to enter a space where preconceptions fall away, relying on my intuition to bring the unseen into the seen. My process is reworking the surface many times leaving traces of history which dictates how the painting will evolve” Kovacs said. Her large gestural works are created with rollers on plywood, allowing a freedom of movement and form that is lyrical yet measured. Speaking of the new acquisition Wayne Tunnicliffe, Head Curator of Australian Art at AGNSW said, “ Onda 2015 exemplifies the artist’s innate understanding of colour and line, and further strengthens the Gallery’s deep holdings of Australian abstract art,”. Painting through memory and emotion, Kovacs’ work responds to the rhythm of the sea. Kovacs has long been acknowledged as one of Australia’s preeminent abstract painters. Her 30 year presence in the Australian painting scene was recognised with a 2011 survey exhibition, Down the Line, at Hazelhurst Regional Gallery and Arts Centre. Kovacs’ work is also held in the collections of the MCA, National Gallery of Australia, National Gallery of Victoria, Artbank and countless regional and private collections. Winning the prestigious $80,000 Bulgari Art Award goes a long way in recognising Kovacs’ significant contribution to Australian art.